I’ve done it! 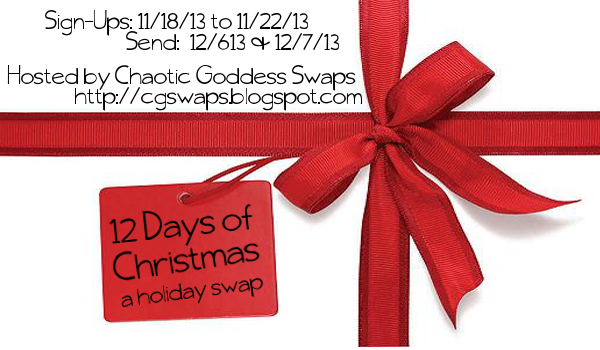 I am now part of Chaotic Goddess Swap: 12 Days of Christmas Swap!! I’ve only been on one blogger swap before, a few years ago and I am so excited to join these fine ladies in what could be the best Christmas Swap ever!! Hey, what better way to meet new people and make new friends than through a swap!? Packages must contain 12 individually-wrapped gifts for your partner. Packages must cost a minimum of $30 and maximum of $40 BEFORE shipping. Send a package that you, yourself, would like to receive- it should be personalized to fit your partner’s preferences and style. You MUST post and link up your swap reveal post (link up will be after Dec 25th). This is non-negotiable. Swap Show-Off Post/Linky goes life on December 26th! Make sure to Sign up now and join in on the fun! !